Candles are placed outside the French embassy in Vilnius, Lithuania, for the victims in Friday's attacks in Paris, Nov. 14, 2015. Scores of appeals for missing people circulated on Twitter and green "I am safe" ticks appeared on Facebook profiles of many Parisians on Saturday, as an outpouring of shock and grief over Friday's deadly assault dominated social media. Instagram, Twitter and Facebook were flooded with tributes, messages of condolences and solidarity for the victims and for France, with #PrayforParis and #PrayersforParis the top trending hashtags by far. "I am trying to locate my cousin Callum Hamish MacDonald," one woman wrote in English on Twitter. The 24-year-old father of a toddler was last seen at the Bataclan concert venue, she said. A man by the name of Jo wrote: "My girlfriend was at the concert. I was supposed to get engaged with her. I don't know if I will see her again." His post on Twitter had been retweeted nearly 3,000 times, with people sending replies of support. Profile pictures were changed en masse, some showing the blue, white and red stripes of the French tricolour flag across their personal photos, or a roughly painted peace symbol doctored to resemble the Eiffel Tower. 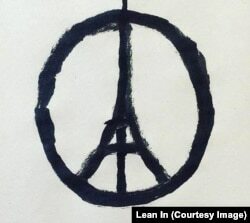 An image fusing the peace sign and Eiffel Tower is circulated on Facebook by the California-based community group Lean In, in the wake of Islamic State terrorist attacks on Paris, Nov. 13, 2015..
"Four friends were marked safe during Paris Terror Attacks," read a typical Facebook message to people with connections to the city. Using the hashtag #SafetyCheck, people on Twitter urged each other to make use of the new Facebook feature, which allows users to hit an "I am safe" button if they are caught up in a big disaster or emergency. Their Facebook contacts are then automatically informed. "Absolutely love Facebook for the 'mark yourself safe' tick! Before calling some family, by using that feature, they told us they were OK," Twitter user @priscamoyesa wrote. Some French Facebook users still had their profile images set to "Je suis Charlie", a slogan that appeared on social media after another deadly Islamist militant attack in January on the Paris offices of the satirical magazine Charlie Hebdo. Friday's attacks, which took place in several locations in the heart of Paris, was claimed by Islamic State. The group said it was revenge for France's policies in the Middle East. President Francois Hollande said the attacks amounted to an act of war against France and declared a state of emergency. Some Facebook users also posted an image of a crying Marianne, a female figure used to represent France and French values. France's far right Twittersphere was ablaze with comments criticising immigration and Islam. In response, hashtags like #MuslimsAreNotTerrorist, #MuslimsStandWithParis were also trending.